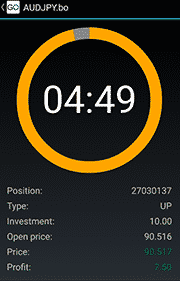 To install GO Markets Binary Options mobile app, simply open the Google Play Store or App Store on your Android or IOS and search for Go Markets BO. 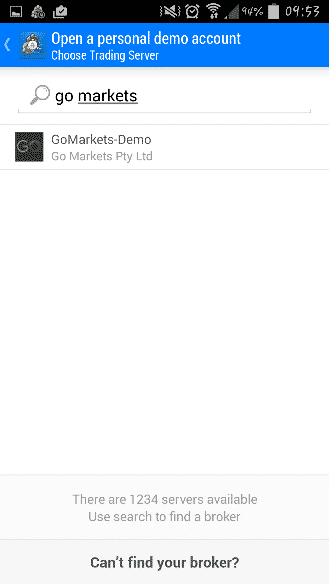 Click the GO Markets icon to install the mobile app to your Android or IOS device. 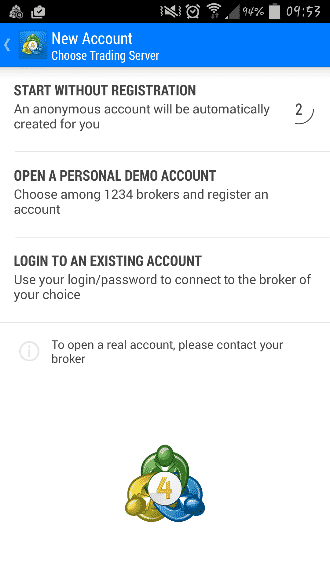 To log in to your GO Markets account, you are required to select the server first. 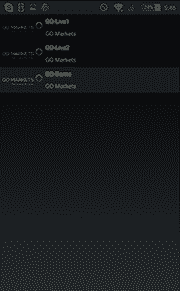 Please tap the gray box to see the available server list with GO Markets. Select the required server and enter the MT4 login details. 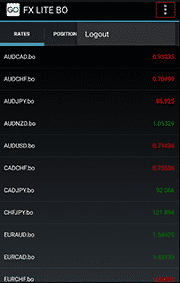 The rates tab shows you the prefilled list of currency pairs available for binary trading. The position tab contains the information about current status of the trading account such as open positions and total investment and profit. 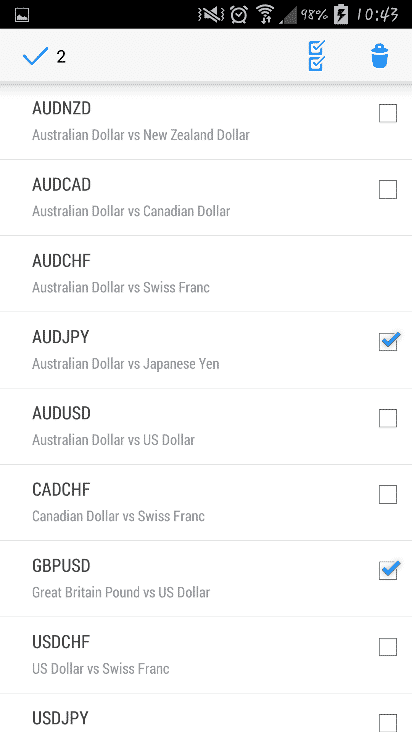 This area shows you all the closed trades under the account. The sub options Today, Week, Month allows to see the daily, weekly, monthly closed history respectively. 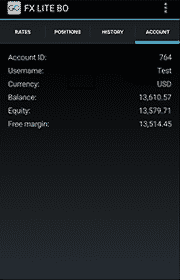 The account tab provides you the trading account information, such as current account balance, Equity and free margin. 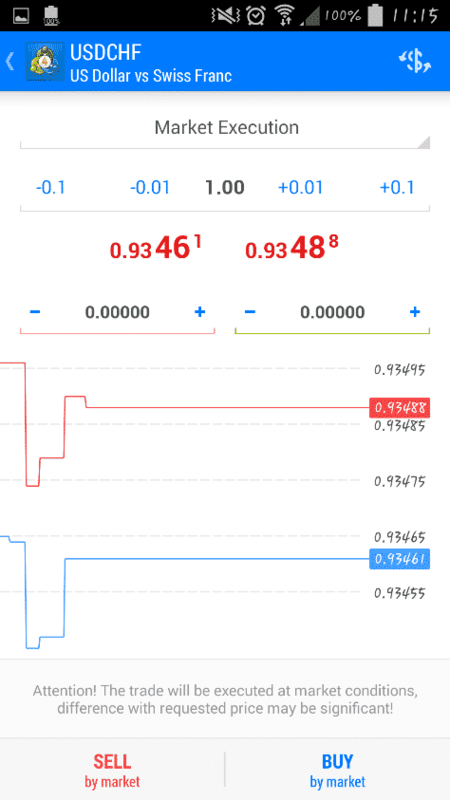 To place a binary trade, simply navigate to the Rate tab and tap on select your favorite .bo symbol to open a trade window. To modify expiry time, tap on the expiry option to get the list of available expiry times (Min time is 5 min and Max is 1 hour). To change the investment value, tap on the investment value to see the available investment options (Min is 10 and Max 250). Up gives an indication that an asset price will increase, whereas Down gives an indication that an asset price will decrease. Choose the required trade option to place a trade. Please tap on the GO icon to navigate back to the home screen. 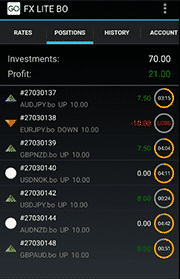 Binary Options are automatically closed out upon expiring. 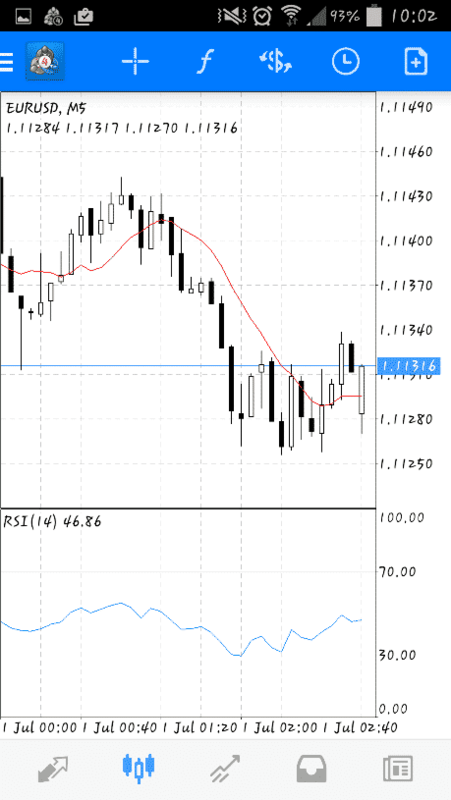 At no point during the duration of the trade can the Binary Options position be closed manually. Simply tap on the three gray dots located on the top right corner of the screen, to get a logout option. 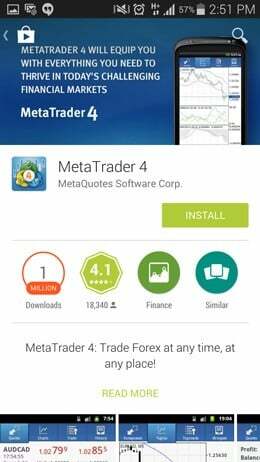 To install the MT4 app, search for ‘MetaTrader 4‘ by ‘MetaQuotes Software Corporation‘ on the Google Play Store or App Store and tap on the app to download. The application will be automatically downloaded and installed onto your phone. To login to your GO Markets account, you will have to search and find for our server first. 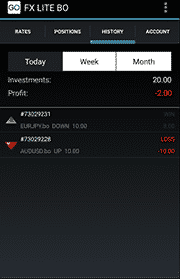 To login with a live account, tap ‘GO Markets-Live1‘. From the results select your server and enter your account details. 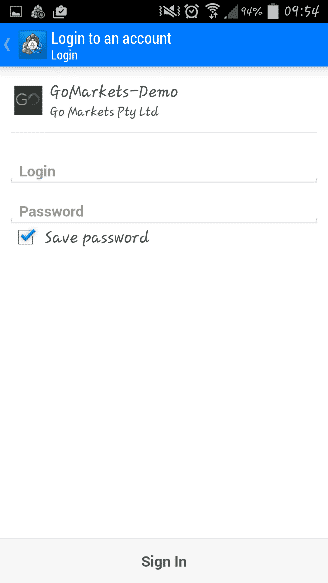 You can save your details by ticking “Save Password” option found on the bottom on the screen. 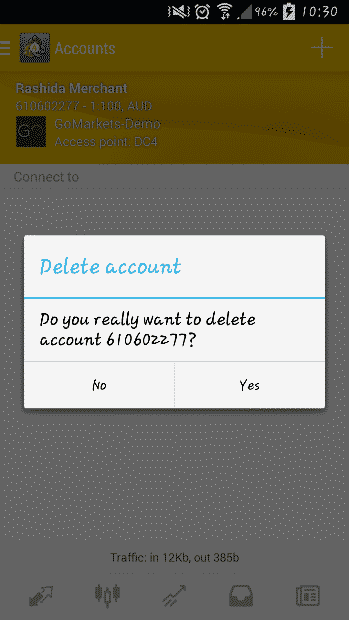 Load the application menu and simply select the account you wish to remove and click delete. Our platform will automatically delete your account from the application. There are 5 tabs to the menu. History: In this area you have a full overview of your closed trades, cancelled or amended pending orders, deposits and withdrawals. 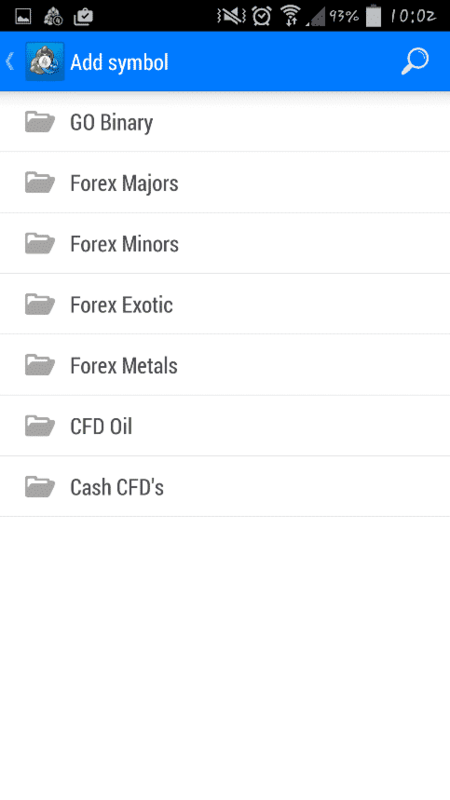 This is one of the 4 main areas of the MetaTrader 4 app and can be customized to suit your trading preferences. To see more detailed information about the instruments, select the ‘Menu‘ button, tap ‘Settings‘ and tick the ‘Advanced mode‘ box. 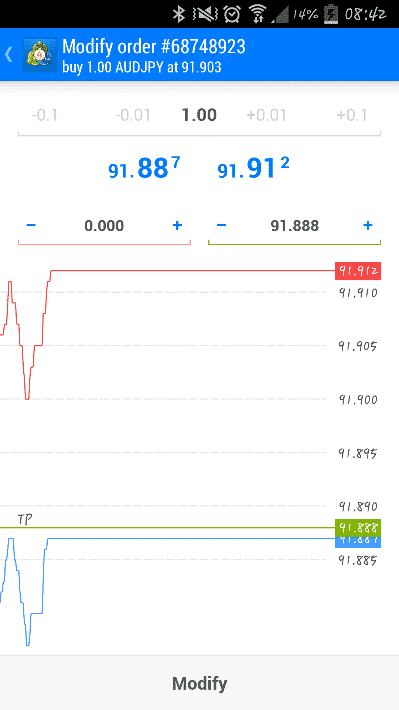 In the advanced mode you also see Spreads, Time data, High and Low prices. 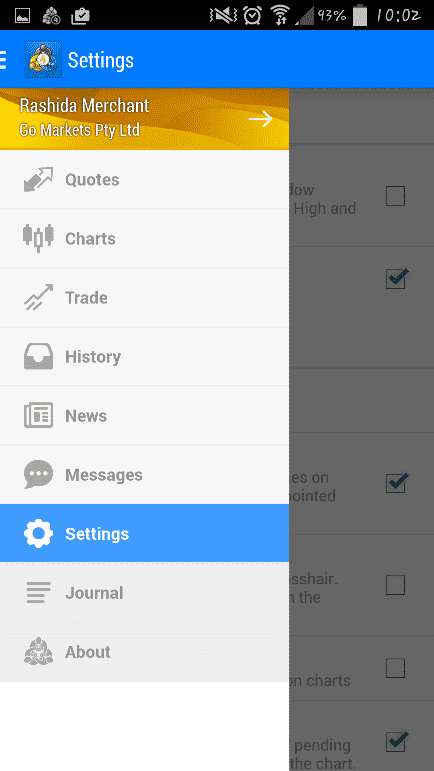 To add an instrument, tap on the symbol and the instruments you wish will be added to your live quotes list. To remove an instrument, tap the ‘bin‘ icon, select the symbols you wish to remove and click on the ‘bin‘ icon to delete. New order- Place orders for instant execution or pending orders. Open chart- Open the ‘Chart‘ window. Symbol properties- Shows symbol properties. Simple view mode- Shows simple information. By tapping the Chart icon you get a full-screen chart. Zooming can be done by moving your fingers vertically (zoom in) or horizontally (zoom out). 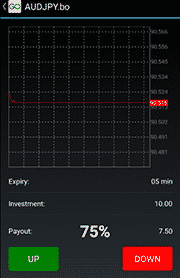 To view the chart on a landscape mode, simply turn your smart phone on the landscape mode. Crosshair: Mouse cursor on chart window. 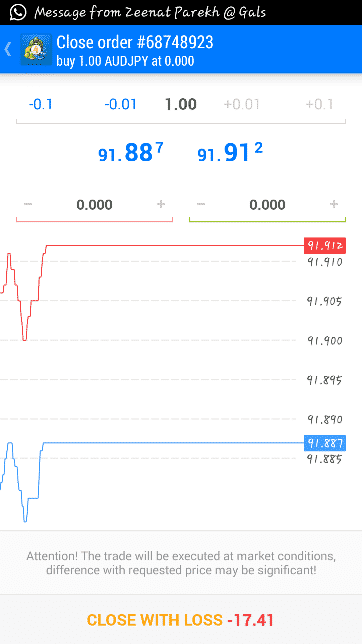 Indicators: Tools for analysing the market trend. Symbol: Select the instrument to be displayed in the chart window. Time frame: Choose between different timeframes (M1, M5, M15, M30, H1, H4, D1). New Order: Place an order on the current symbol. 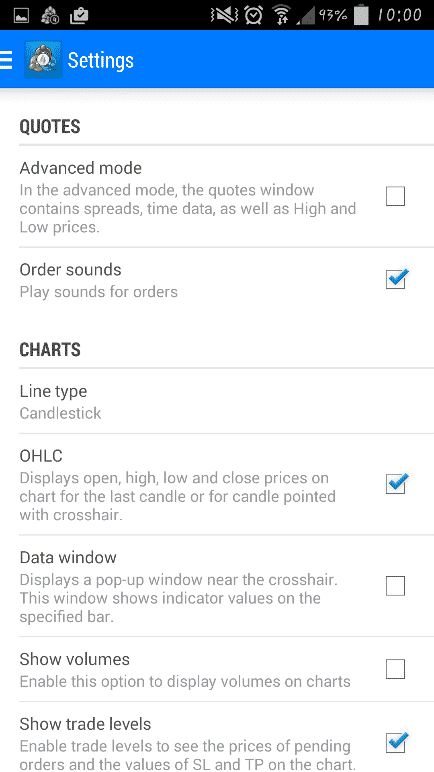 Go to ‘Quotes‘, tap the instrument you want to trade and select ‘New Order‘. Go to ‘Trade‘, tap + sign to open a trade. 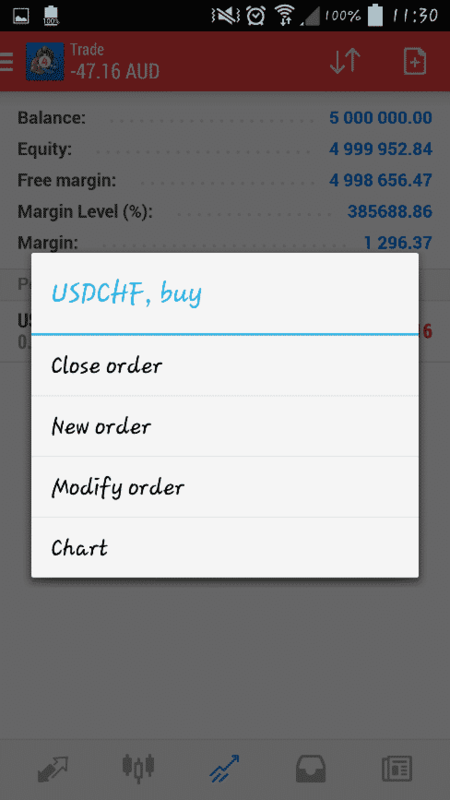 Then, select the instrument from the drop down menu, enter the volume you wish to trade and tap ‘place‘ at the bottom of the screen. In order to close open positions you have to go to the ‘Trade‘ window. 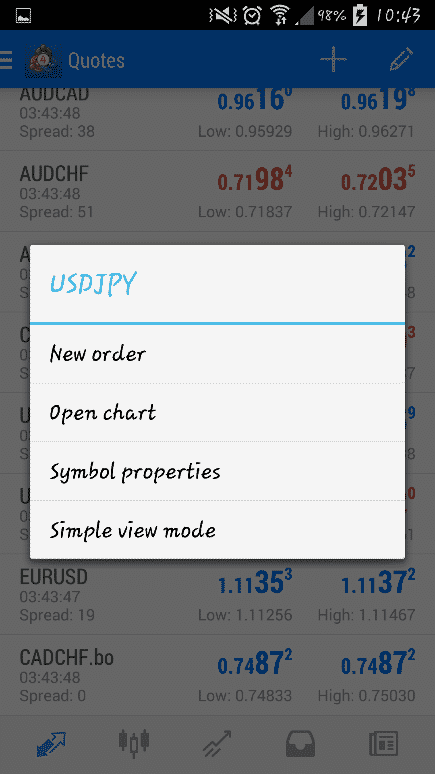 Tap and hold the selected position until the sub-menu is displayed and tap ‘Close order‘ or ‘Modify order‘. Select the “Trade” tab to view your open positions and click on the order you wish to modify. In the menu that will appear, select the “Modify Order” option. Review and confirm changes by selecting the “Modify” option on the bottom of the screen. Upon completion of the request a confirmation screen will appear. You can always go back and check on modified positions by visiting the “History” tab. Select the “Trade” tab to view your open positions and select the order you wish to close. In the menu that will appear on the order, select the “Close Order” option. Review and confirm your request by selecting “Close Order“. 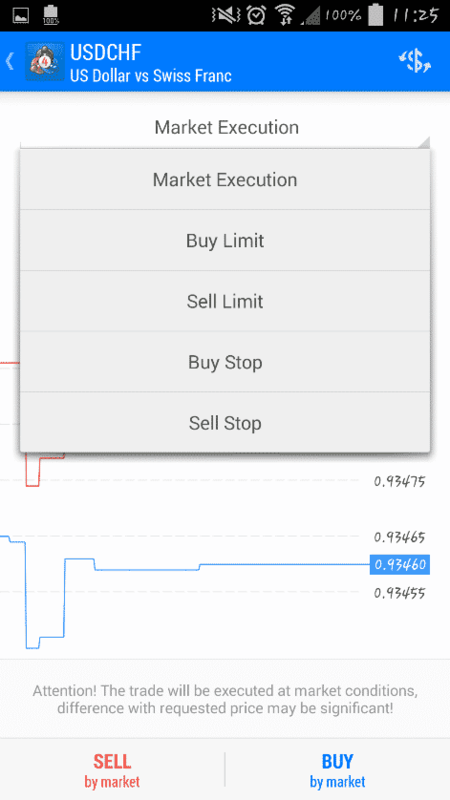 GO Markets is excited to introduce both new and experienced traders to our mobile trading platform, with a convenient MT4 app that’s compatible with Android and iPhone devices. 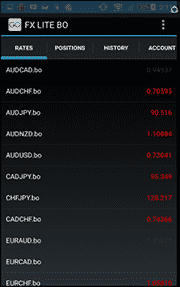 Fast, reliable and completely instantaneous, MT4 for mobile allows you to trade foreign currencies anytime and anywhere. 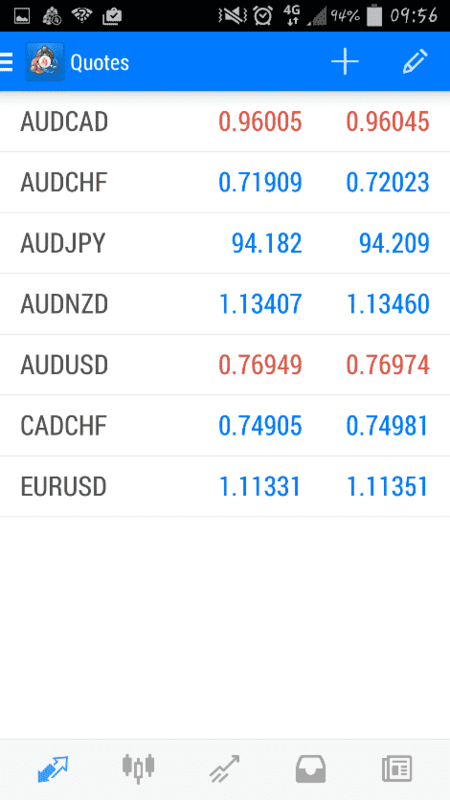 The MetraTrader Android or iPhone app download gives you the opportunity to implement your trading strategies effectively. Allowing you to open up to 10 windows during your trading, the MT4 app also allows you to adjust colour settings for a comfortable viewing experience.